I made a lovely rump roast over the weekend, and ended up with a lot left over. And the question was raised, at least in my mind, what to do with the leftovers. Now, the piece that was left was lovely and rare, and very lean. 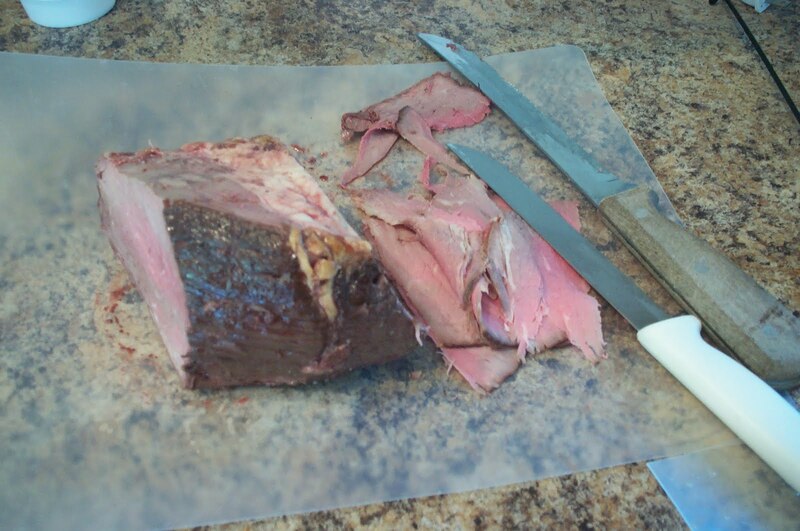 And I knew I could cut it very thin and I could make a nice Beef Dip or French Dip with it. And I might still, but what got my mouth-watering was a nice Philly Sandwich. This is not to be confused with the ‘real thing’, this one is the version we’re familiar with down here. 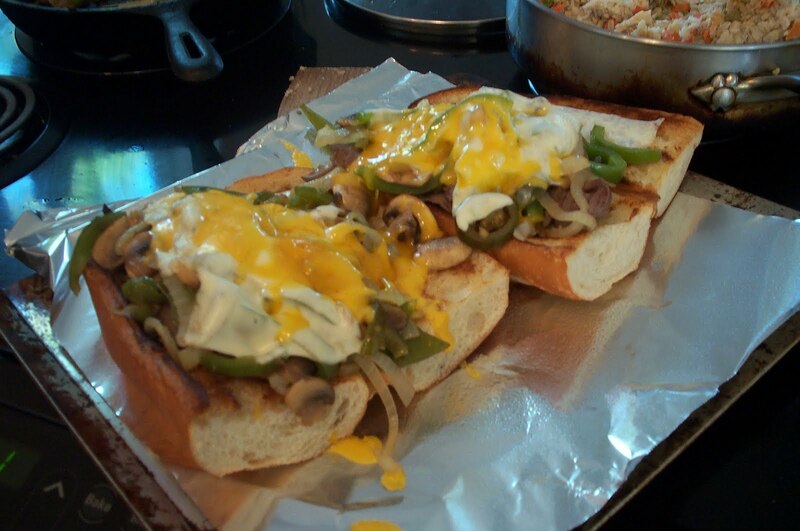 There used to be a restaurant locally that had the best sandwich and when you ordered it ‘all the way’, it came complete with mushrooms and jalapeno’s, the pickled kind. And it was very, very, good. The nice cheesy, oniony, peppery, oozy kind of good. I made many attempts to replicated it and it wasn’t quite right. But I think I’ve finally nailed it. *giggle* Just need more cheese the next time and to let it melt into the onion/pepper/mushroom mixture a little more, then again, I like cheese. Here’s how I put it together. 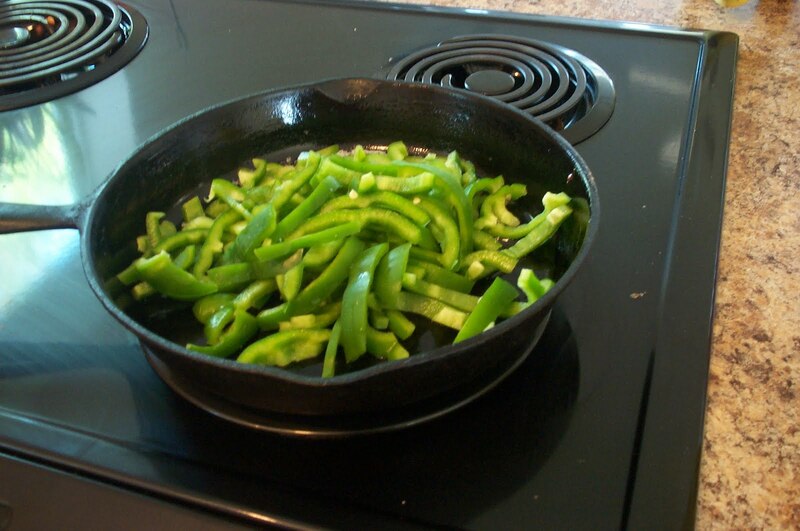 I sliced up some green peppers, and sautéed them in a little EVOO and butter, just till they were done. Sliced up some Onions, sautéed them with a little more EVOO and butter, just til they were translucent and then added sliced Mushrooms. And a little more butter, giggle. sautéed them all together for a few minutes. The olive oil is good for you anyway and keeps the butter from browning or burning as easily. 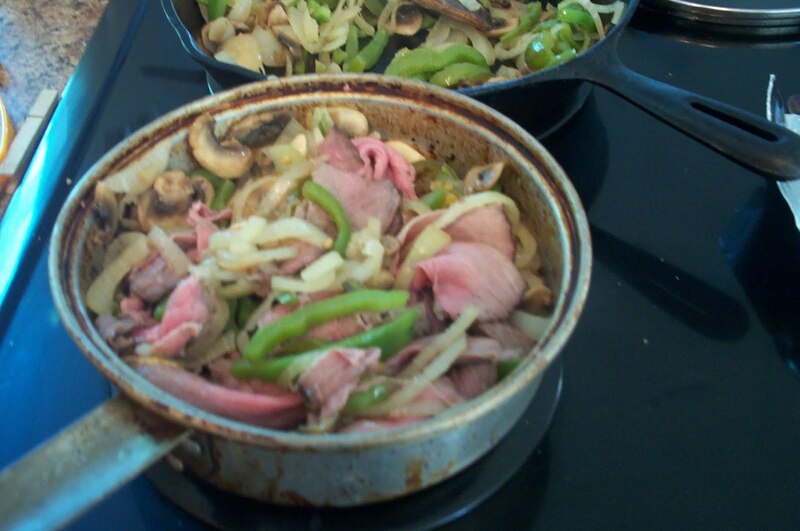 Then I took some very thinly sliced roast beef, some of the veggie mixture and a few slices of pickled jalapeno’s (only add jalapeno’s if you want heat) and put them into a separate pan, and basically let the veggies warm the meat, and finished cooking it a smidge more. You don’t want to let the meat cook too much more, as it toughens it. (Trust me on this, I know whereof I speak). I cut the rolls in half, buttered them and quickly browned them in a pan. As soon as they were done, I heaped the meat/veggie mixture on top, added a couple of slices of mozzarella cheese, and some shredded cheddar cheese (cause I could), and placed them under the broiler in the oven until the cheese melted. And there you have it. And they were good. Next time, though, I will use provolone cheese, as I think its melt point is better, and makes for a more gooey sandwich. 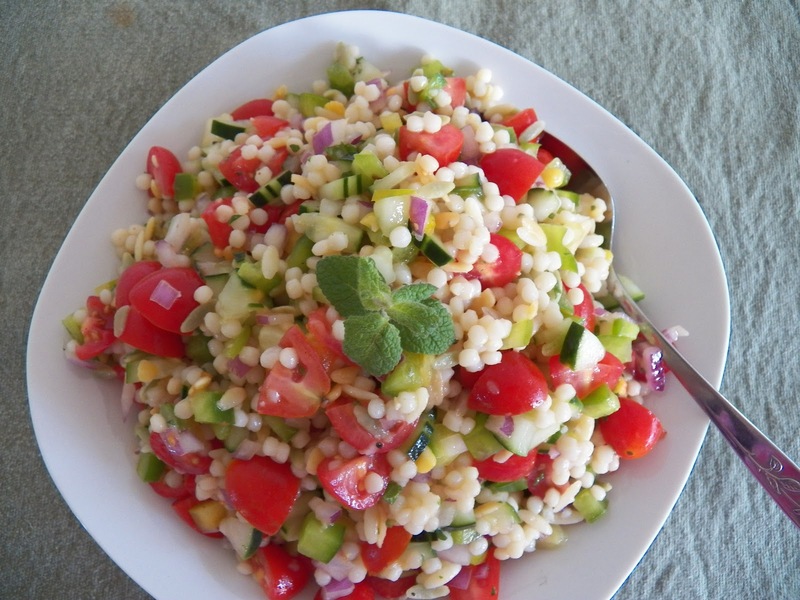 I neglected to post the recipe for the Gazpacho Couscous the other day, on purpose. I thought the blog post was getting a little long so decided to just post the pictures from Tapas night . 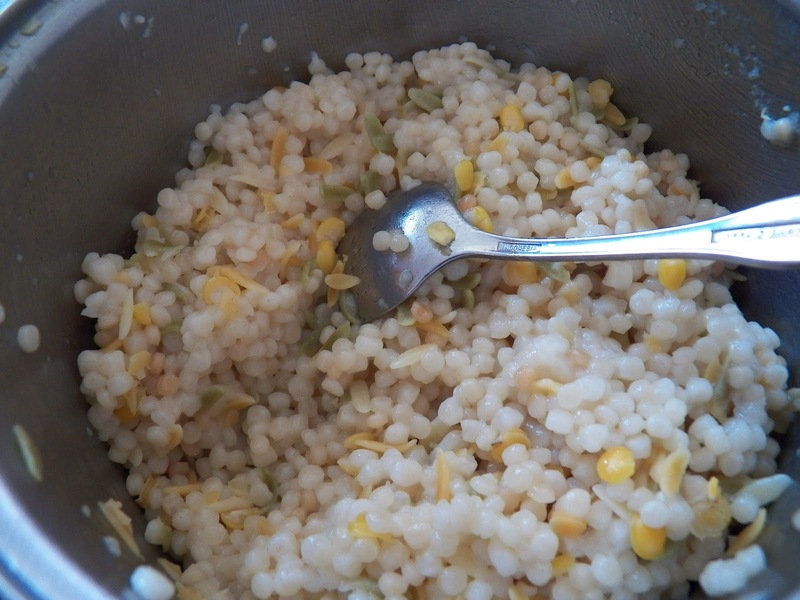 But, I took a lot of pictures for the Couscous recipes, and since I did, I want to share with you. By the way, I have to admit to something here, I was so excited when I saw the package of Israeli Couscous at World Market, I just grabbed it and hurried up and bought it and put it in my pantry to use. Then when I pulled it out on Saturday to make these dishes, I read the label. Turns out what I bought was Israeli Couscous with lentils, green peas and orzo. But since I had the water boiling already, I went ahead and cooked it. And you know it was good. I did taste it, and it was a blank slate. So I decided to go ahead and make the Gazpacho Couscous anyway. I mean if I didn’t tell people that I hadn’t read the label, they were never going to know it wasn’t quite what I had intended to cook. 1 1/2 Cups uncooked Israeli Couscous, cooked according to package directions. 2 tablespoons (more or less) finely minced mint leaves. 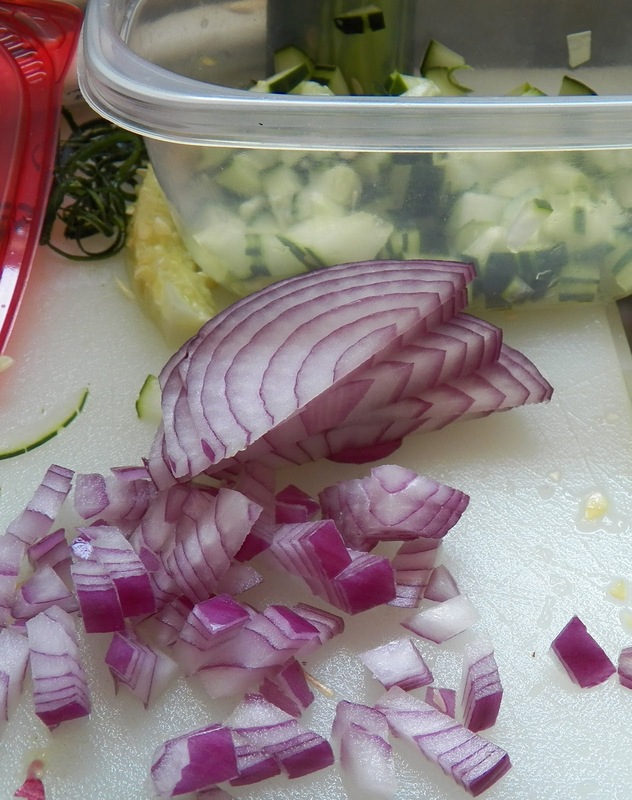 Toss all together and place in fridge for at least 3 hours, then taste and adjust seasonings. I have to say this turned out so good, but did make a lot, enough that I was able to share with friends. In other words, they got to take some home with them. And I also made some Courgettes and Mushroom Couscous as well. That wasn’t as photogenic, but it sure tasted good. Here’s the how to on that one. Oh and Courgettes, we call them Zucchini on this side of the pond, personally, I’m going to continue to call them Courgettes, cause I think it elevates them, a little. Makes them just a tad more elegant, and if you think of all the things you can make with a Zuch, well, I just think they deserve to be called something cool. 2 tablespoons fresh parsley, chopped. 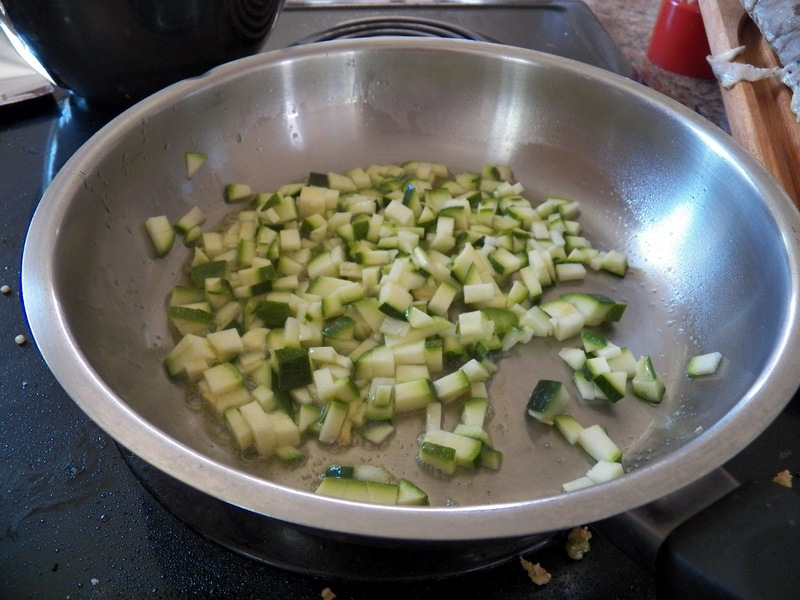 Saute the mushrooms, courgettes and onion in a mixture of 2 tablespoons butter and EVOO, until softened. 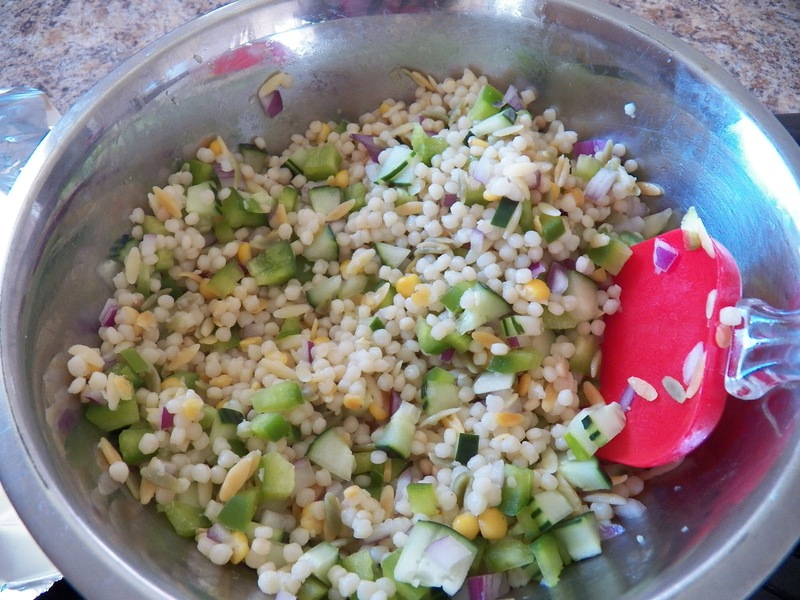 Mix with the cooked couscous and then add the Lemon Juice and 1/4 cup EVOO and toss. Add the the chopped parsley and taste. Season to taste with salt and pepper. 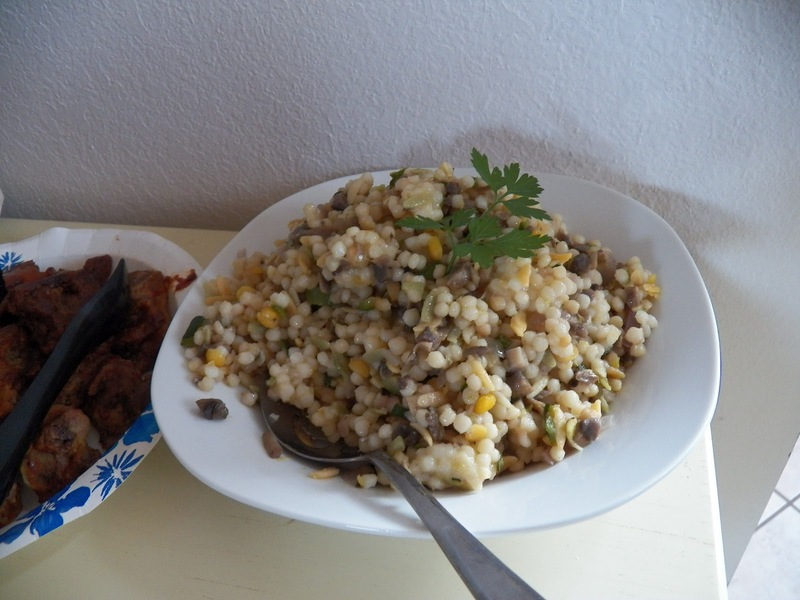 So there you have it, the two Couscous recipes, that I got from Chica Andaluza . You should go by and check out her blog as well. 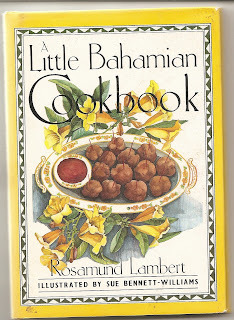 She’s got some great recipes and stories there. Gazpacho Couscous & more at Tapas Night. I love hosting our Monthly Tapas night, not only do I get to socialize with some very interesting people, and bonus, get to meet new people every month, I get to make new recipes like these two Couscous recipes from Chica Andaluza’s website. And the Gazpacho Couscous recipe was well received. Not only did it look purty, it tasted great. The Courgettes and Mushroom dish was also tasty, but I choose to warm it a little before serving. Oh and by the way, Courgettes are Zucchini. I had to look it up in Wikipedia, but I thought Courgettes sounded fancier than Zucchini. I’ll be posting the recipes for those in a couple of days. Dessert first, this was wonderful, a baked apple dessert. A really tasty cheese log and crackers. Take a look at the serving dish, this is actually a fabric server, the corners tie together to make a square dish and it is ideal for serving either sliced bread or in this case a cheese log and crackers. A selection of pickles. That just sounds so ordinary. They weren’t, Harriet always comes up with some fun stuff, and these were fun. From the left, pickled cauliflower, Brussels’ sprouts, beets and in the back, Zucchini. I tried all of them, but the Brussels Sprouts, knocked my socks off. I’m usually not a fan of them, but these were so good. Some BBQ offerings, ribs are in the back, these were also very good. 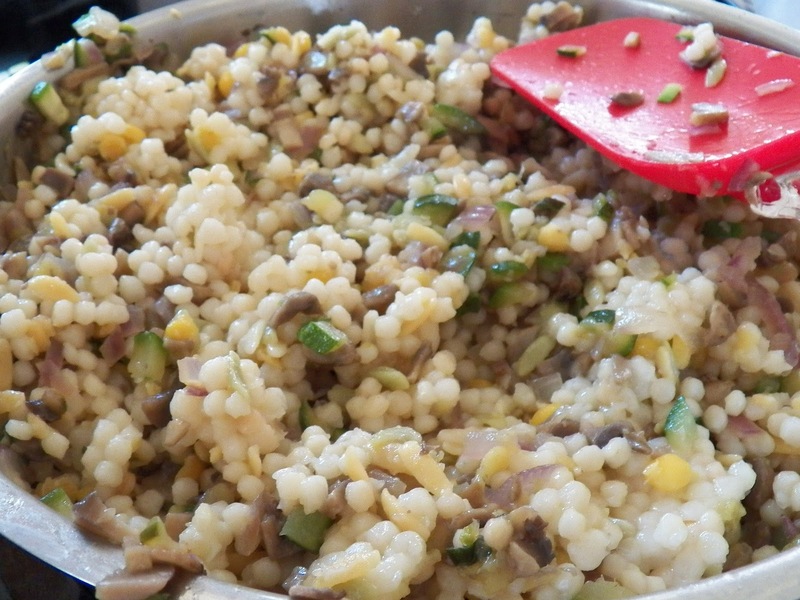 The Courgette’s and Mushrooms Couscous. They were OK, but I think I’m going to take the leftovers and add some Edamame to them, and they will be my dinner tonight. I’ll share the recipe later on in the week. Cuban Chicken Pie. Imagine if you will, the following ingredients put together. Chicken, green olives, capers, tomatoes, corn, craisins Sound a little weird? This was so good. I think I could have just made a meal of this alone. I noticed that there wasn’t much left when they went home. And best of all Kathy is going to give me the recipe. I’ll share it here. I wish now I’d taken a picture of it after it had been cut into, but I was too busy socializing. Hey, it’s my party and I can have fun if I want to. Then there was this wonderful Salsa and Chips. Gotta say there wasn’t much left for my guest to take back home. In what had to be a first, we actually had two people bring Spanakoppita. Luckily for us, they came at different times, so most of them got eaten. One thing I’ve never tried to make, but I think I want to try my hand at them sometime. I know I can eat a lot of them, well, a couple or three at a time. And they’re good for you as well. Then there was this, Tunata with grilled Tuscan bread. Dare I admit it, I went back for seconds, or was that thirds? All I know is, this was so good. OMG good. Sorry, I tend to get excited about food sometimes. Then there was this dish of yellow rice. It went well with the Pork Loin, and was also very good. One of our guests brought this Smoked Amberjack. It was caught the day before, and smoked. Being a Dane, I have an affinity for smoked or preserved fish anyway, so I of course scarfed up a couple of pieces. I was left some so I’m going to try my hand at making a fish dip in a couple of days. Smoked Amberjack is a wonderful fish. And lastly, a very blurry picture of a Key Lime pie, Which was also very good. I got a taste of the last sliver left. So there you have it, an overview of the food served and consumed last night. I love doing a Tapas night. Apart from having to clean my house, (which I probably should do anyway), I get to try new dishes, and I get to try other people’s dishes as well. And because it’s ‘small plates’ everyone gets to try something, and no one goes home hungry. The cleanup for me is a breeze as well. All I have to do is wash some glasses. And wipe down counters and as I’m doing the tidying up, I get to think back on some of the conversations I enjoyed and the people I got to meet. There’s always someone new here. We encourage our guests to bring someone along, and that has been a good thing, over all. Awhile back I was talking with a friend and comparing notes on using our George Foreman grills. I have one and use it a lot. And I do mean a lot. I don’t own a proper BBQ grill anymore, and have to say that for the most part I don’t miss it. She was telling me how easy bacon wrapped shrimp were to do on the grill. And it sounded so good. 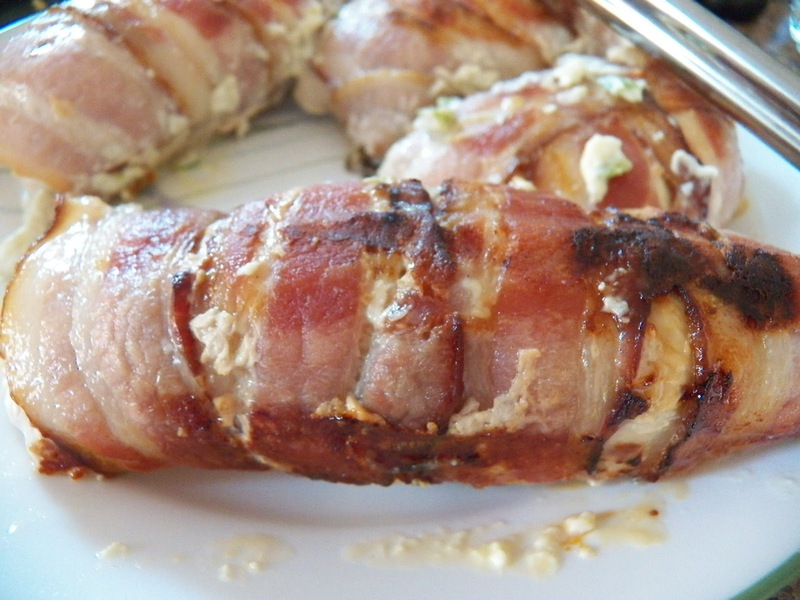 But then I ran across this recipe on the Charbroil grill site. 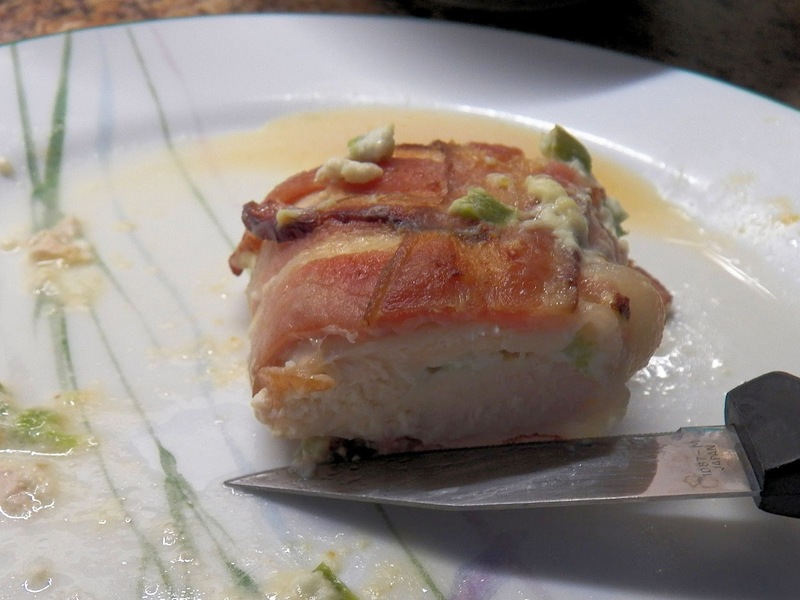 Bacon Wrapped Jalapeno Popper Stuffed chicken breasts. YUM. 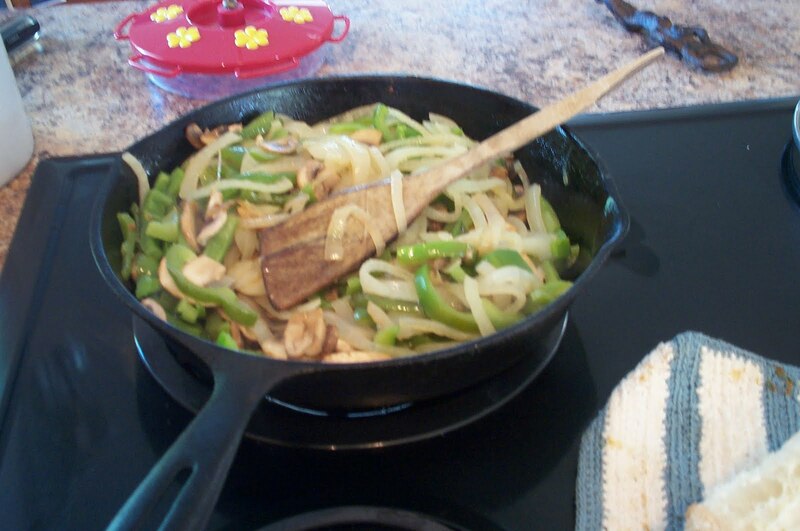 I thought that it might just work out on my George Forman grill so I decided to make them for dinner one night. Now, I did not chill the filling, and the jalapeno’s I used were way too mild for our taste, but on the whole, not a bad dish. 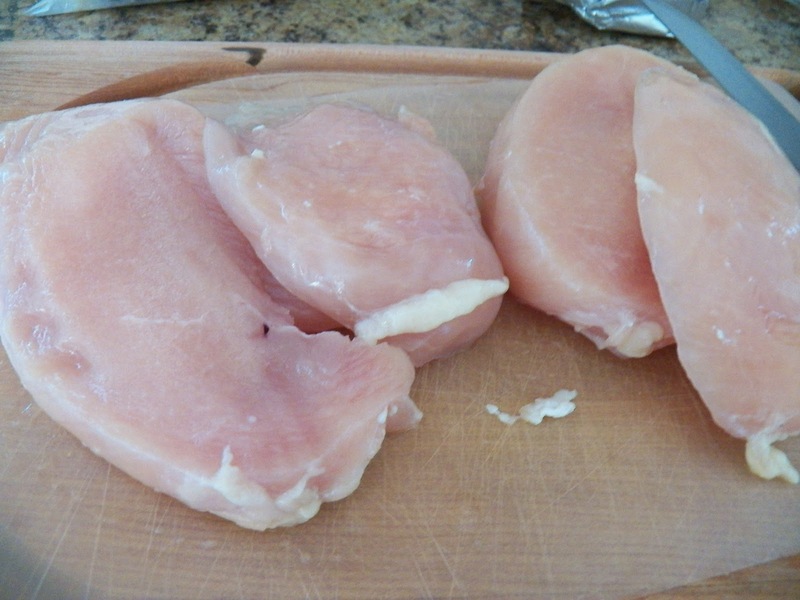 I had two big chicken breasts in the freezer so I pulled them out, let them thaw for a little while, then while they were still a little frozen cut them into cutlets, and then proceeded to cut pockets into the cutlets. Believe me when I say these were BIG chicken breasts. And it worked very well. 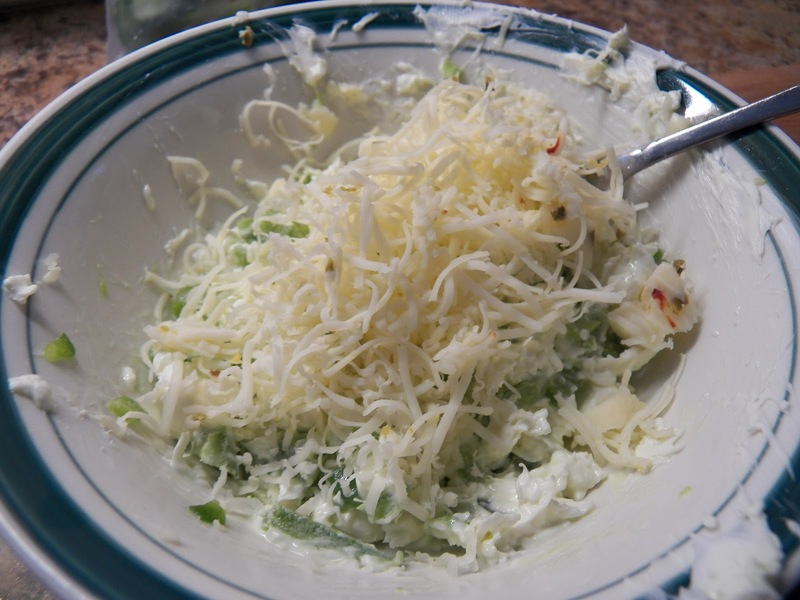 I had the filling made, cream cheese, chopped jalapeno’s and then decided to add some Shredded Pepper Jack to the mixture. 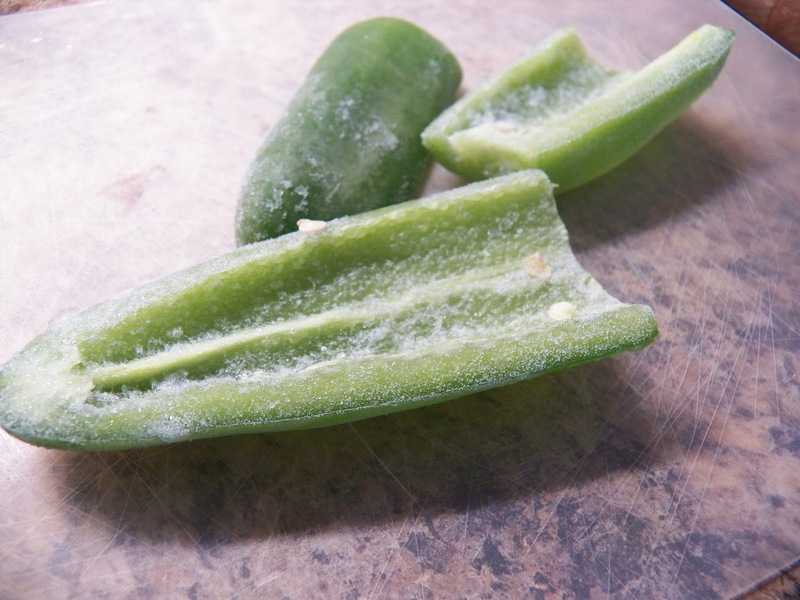 And if you’ve read any of my posts in the past, you know I always have frozen jalapeno’s in the freezer. Never know when you’re going to need them. 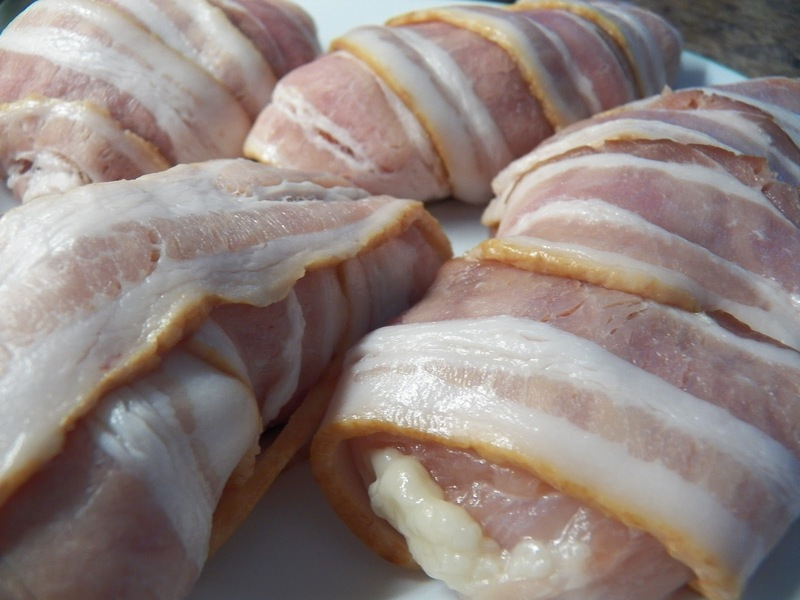 Now, at this point I should have stuffed the chicken breasts and then put them into the fridge to firm up, but hey, it was late, I wanted to get dinner made and on the table so I just stuffed them and wrapped them in bacon. 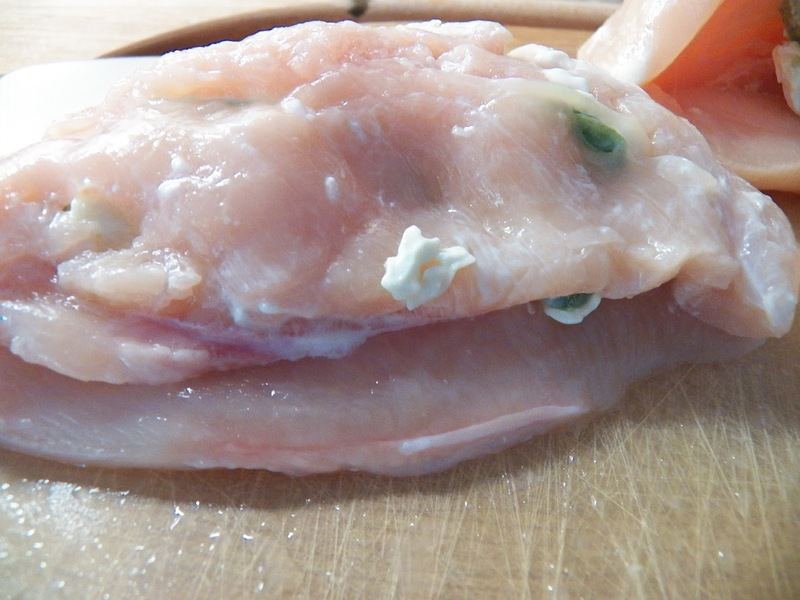 I had my grill heated up, and placed the chicken breasts on the grill, and had my handy, dandy wired thermometer stuck in the largest of the chicken breasts to check the temp. Well, the filling kinda leaked out, and the grill didn’t cook them as evenly as I would have liked, but the flavour wasn’t bad. 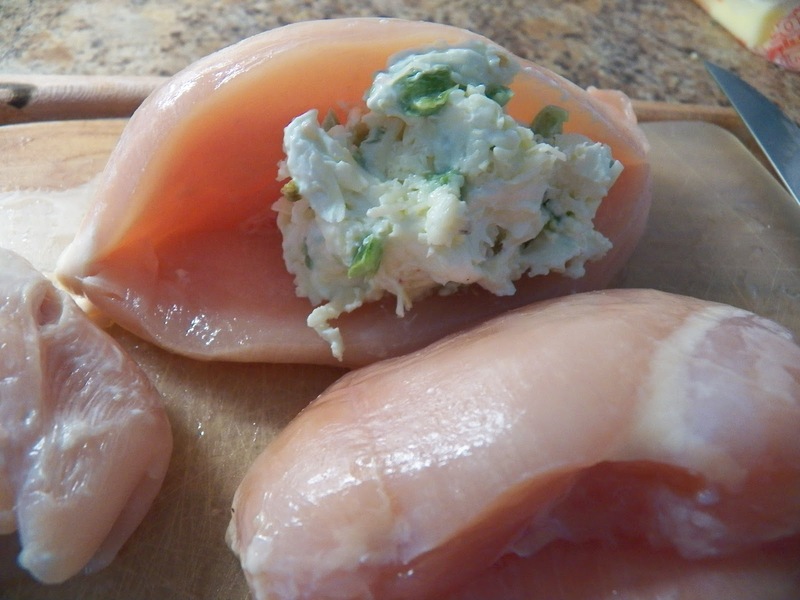 I think if I make this again, I’ll change the ratio of cheese a little, more grated cheese, and instead of chopping the jalapeño peppers up, I’ll just stuff the pepper, then put it inside the chicken breast. I think the filling will stay in place better. And I will par cook the bacon a little as well. Because I used the grill, the bacon didn’t cook as well as it could have. But it was still pretty darn good. Shrimp and Grits and Boat Club this month. I love grits, plain with some butter and syrup on top, or loaded with cheese and served alongside some fish. I’ve even had leftover grits, fried and with jam on top. That was a little strange however. But I think I now have a dish in my repertoire that I will make again and again. I would have followed this recipe which I got from Miz Helen’s Country Cottage and she got from the Homesick Texan cookbook, but as I think I’ve said in the past, I live in a very small town and our little grocery store doesn’t carry a lot of stuff. And when you have to drive over 30 miles to the next largest town to get some items, you make do. And I made do, with some rather nice results. This recipe called for fresh tomatillo’s, or canned. Our grocery store doesn’t carry fresh tomatillo’s but they used to carry canned ones so I thought I was safe I could plan accordingly. Well, gee, guess what, they don’t carry that either, anymore. So I improvised, and it worked out well. I always have at least 2 cans of La Costena Green Mexican Salsa in my cupboard. It goes great over Peggy’s Paparito’s. I served the Grits with Lime Tequila shrimp. Cook grits in the milk/water until done. let it heat through a little, then stir in the cheeses. Serve immediately with some Lime Tequila Shrimp. 2 pounds shrimp, in shell or shelled. Prepare poaching liquid by letting it come to a boil and simmering it for a few minutes to release the spices into the water. Avoid standing over the pot and inhaling the wonderful smell as the cayenne pepper can become rather strong. Just keep your distance, not too far away. Add the shrimp to the boiling water, one-third at a time. Remove the shrimp after a couple of minutes, or when they start to float up and turn pink. 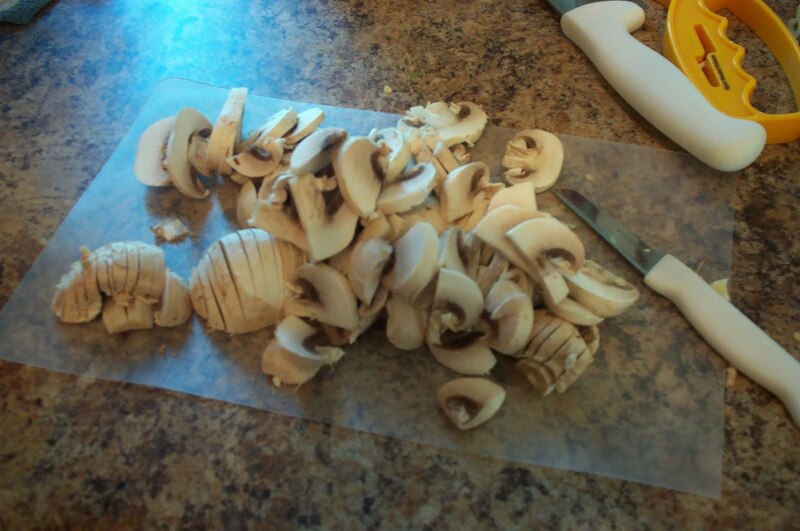 Place them on a baking sheet to cool down so you can peel them later if needed or desired. Set them aside while poaching the rest of the shrimp. Melt butter in pan, add shrimp, tequila, lime juice and cilantro. Warm through for just a couple of minutes or less, then serve alongside the Tomatillo Salsa Grits. Kathy made some Pork Tenderloins with a totally yummy dipping sauce and some stuffed mushrooms. The dipping sauce is basically marmalade melted in the microwave, mixed with some soy sauce. She had some ginger marmalade here and, oh was it good. This is a great dip for coconut shrimp as well. We also had an awesome Potato Salad with fresh apples and dill. 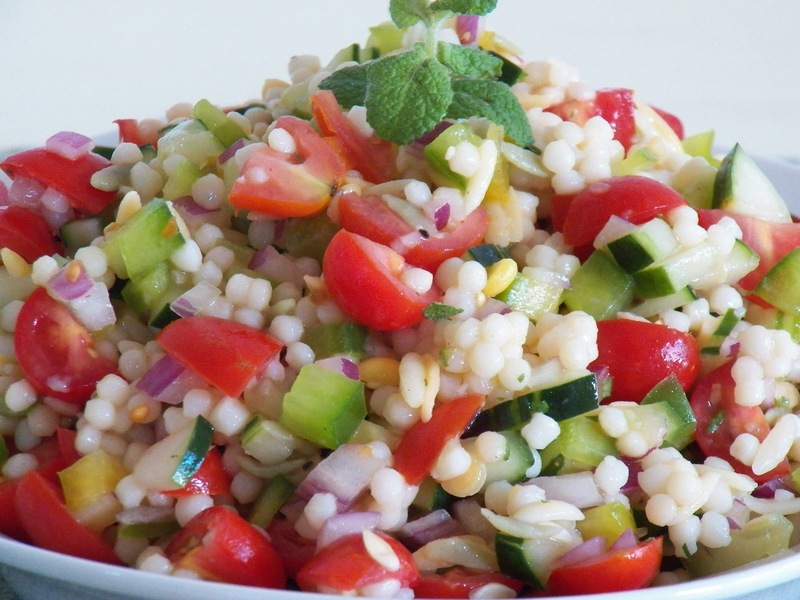 Tabouli, which I love. I can’t wait for my parsley plant to recover from the butterfly caterpillars feasting on it so I can make some Tabouli again. This was so fresh tasting. You have to cook cornbread in an iron skillet. Really, you do. Otherwise you don’t get that nice crust and the texture seems to come out all wrong as well. This was some of the best cornbread I’ve had in a long time. We also had some really great pickled cucumbers and beets. Such a great accompaniment to the meal. There is nothing as good as home pickled beets. I think I could have eaten all the beets by myself. I did practice some restraint however, I only ate some of them. As usual, great food, even better company and a good time was had by all. It’s been awhile since I’ve had some Peas n’ Rice so I thought I would make some this week. I’m lucky in that I have access to Pigeon Peas here, but if you don’t have any in your store, just use some black eyed peas. They work very well. And my version of this dish isn’t as totally authentic as it could be, but I make it to our taste, and we like it this way. Most recipes call for salt pork, but we like the flavour of ham in this dish. This is a great way to stretch a little bit of ham to feed a lot of people. To start with, get your ham out and cut it into little bitty pieces. Throw in a couple of slices of bacon as well, bacon goes with everything. You want a fine dice here. You need about 4 oz. or more. As I said, this is a great recipe for stretching a bit of meat. And with the rice and peas, you’re actually getting a lot of protein as well as some complex carbs. It’s all good. 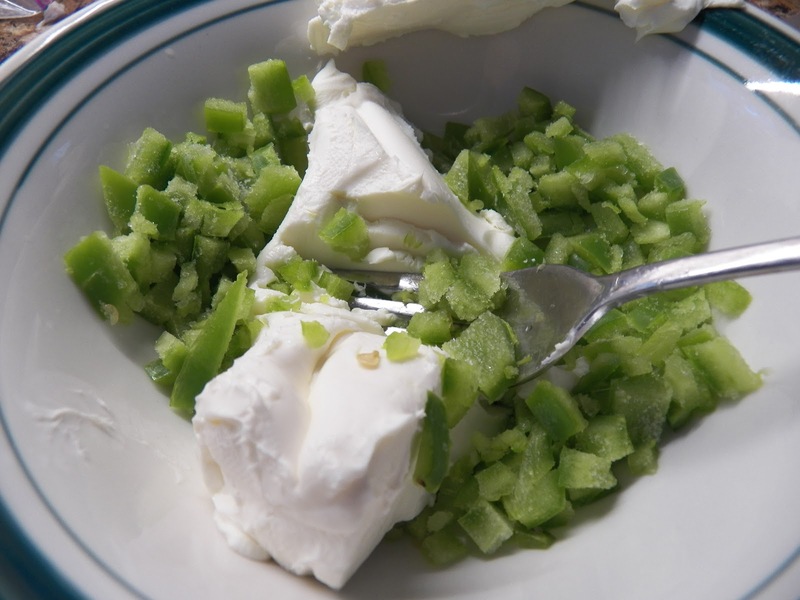 stir it once in a while as you’re chopping up a green pepper, a stalk or two of celery, and an onion til they are also a fine dice. Throw them into the pan with the sautéed meat and cook until the veggies have cooked through, and are getting a little mushy. When they are just a little mushy, add the tomato paste and stir in to the pan, and let it cook down for a few more minutes, stirring frequently. And another couple of tablespoons of Tomato Paste, if desired. I like my Peas n’ Rice with a fair amount of tomato paste. Then stir it and let it cook for another couple of minutes before adding the rice, water and thyme. If you have fresh thyme, place 4 or 5 sprigs on top after the rice is added. Cover and cook for 15 minutes or until the rice is cooked through. 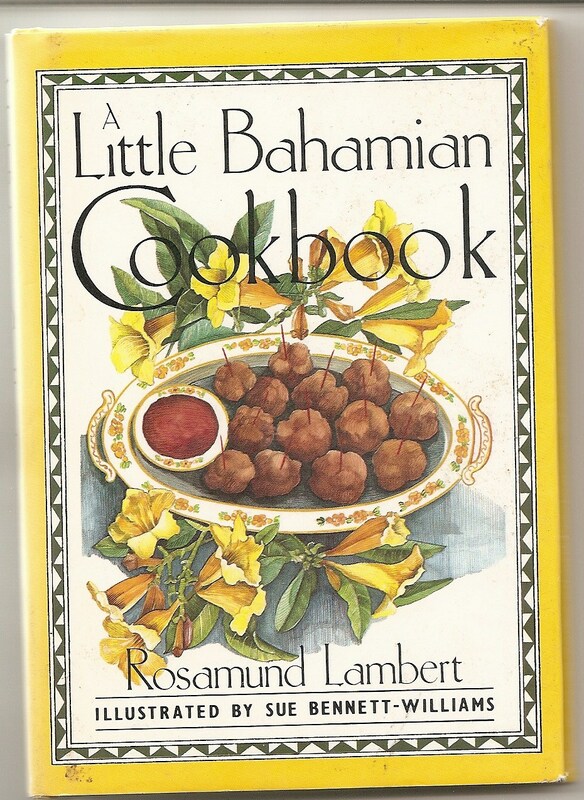 Serve alongside some Bahamian Mac n’ Cheese, and enjoy with a nice cold Kalik. Saute the bacon and ham until they are nicely browned, add the veggies and sauté lightly, cover and let cook for about 10 minutes on low heat, stirring occasionally. Add the tomato paste and continue to cook, stirring frequently. Add the Pigeon Peas and continue to cook for a few more minutes. Finally add the rice and water as well as the thyme, cover and let cook until the rice is done. Serve alongside a grilled meat or Mac n’ Cheese. 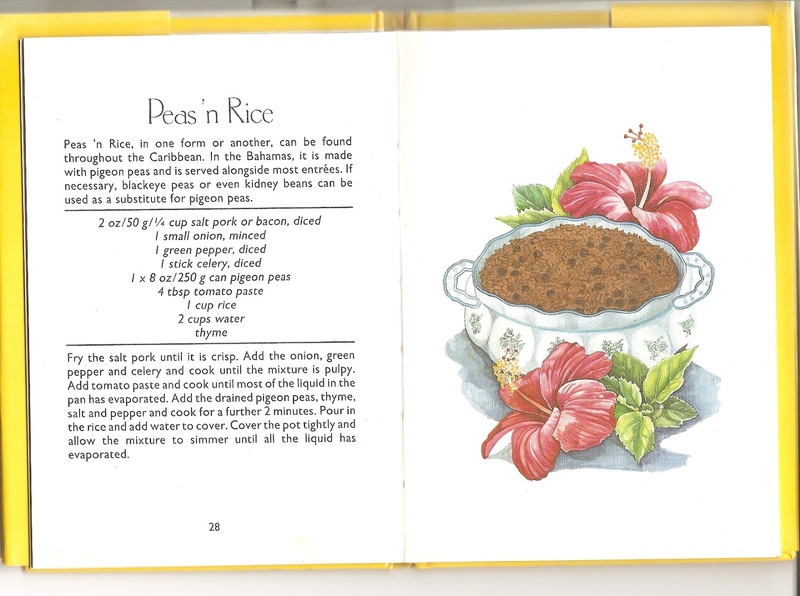 And this is where I go for the recipes, of course I had to put my spin on the Peas n’ Rice. I’ve made this the ‘proper’ way before, but really like the smoked flavour of the bacon and ham better. Try this for a little different dish, and something you can share with your family.